The ether bardo installation explores my connection to Bhutan as well as other important influences. The piece fuses ancient mystic traditions with modern technological devices. The central round green image is a one year time lapse of the sun that spins slowly and silently. 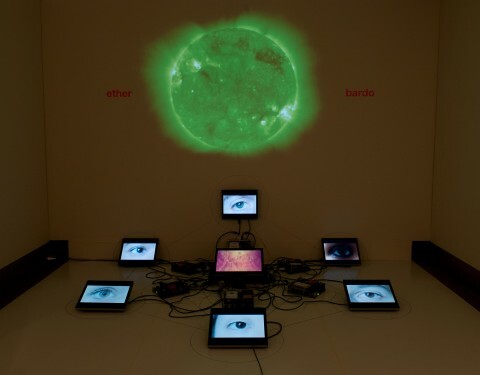 On each side of the sun it says “ether” and “bardo” in neon orange. The central monitor on the floor plays a sound visualization of the song Unity Meditation One created by David Hykes as a collaboration for this piece. Surrounding the center are monitors with video of eyes. These monitors are attached to disembodied computers that are arranged to fit into a large floor and wall drawing of Metatron’s Cube. At the base of the installation is a floor and wall drawing of Metatron’s cube. The cube is a sacred geometrical object and three dimensional orthographic projections of the five platonic solids can be created using lines from within the cube. The fifth platonic solid added by Aristotle was ether, the dodecahedron, and he postulated that the heavens were made of this element. Computer networks also use the name Ethernet to describe the cabling and general networking infrastructure that connect all modern computer networks. 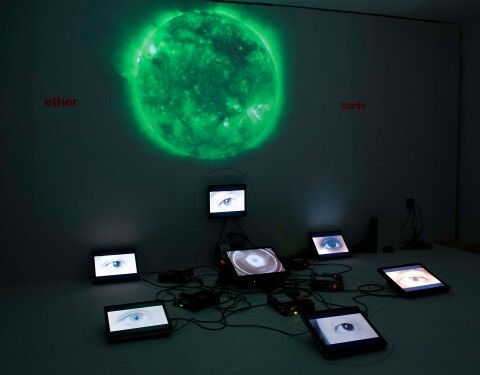 And so the ether in the installation references the combination of the ancient concept of the carrier element of the heavens to the modern technological wired medium that connects all the computers of the world much like orbiting satellites would be connected in the heavens. 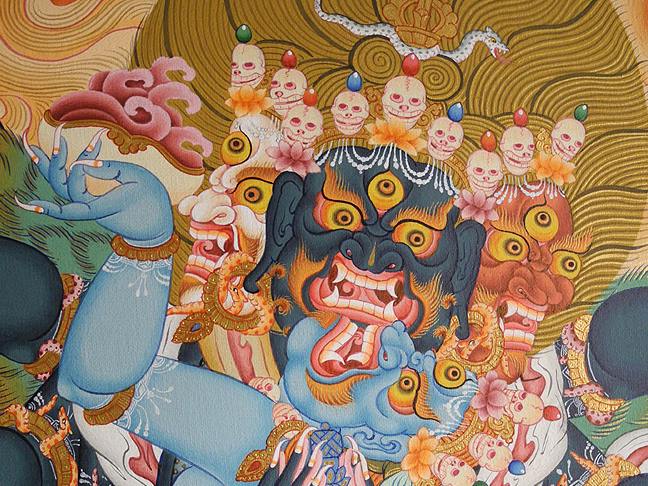 Bardo in the installation explores the Buddhist concept of the afterlife. Bardo means literally “intermediate or transitional state” It is the state one experiences from the moment of death until being reborn. During this transitional state one has the chance for liberation from rebirth. One experiences all the choices made in the past life and has other varied experiences ranging from pleasant to horrifying before finally being reborn again. The installation itself is a kind of bardo, a transitional form of ancient and new physicalities as well as a tangle of disembodied consciousness held in computer memory. Alchemically it is a transmutation of forms, a reduction of thoughts and ideas seeking a more purified state of being. Another aspect of the installation is the audio. In my studies of sacred geometry I came upon GI Gurdjieff and his use of the Enneagram in the Fourth Way teachings. 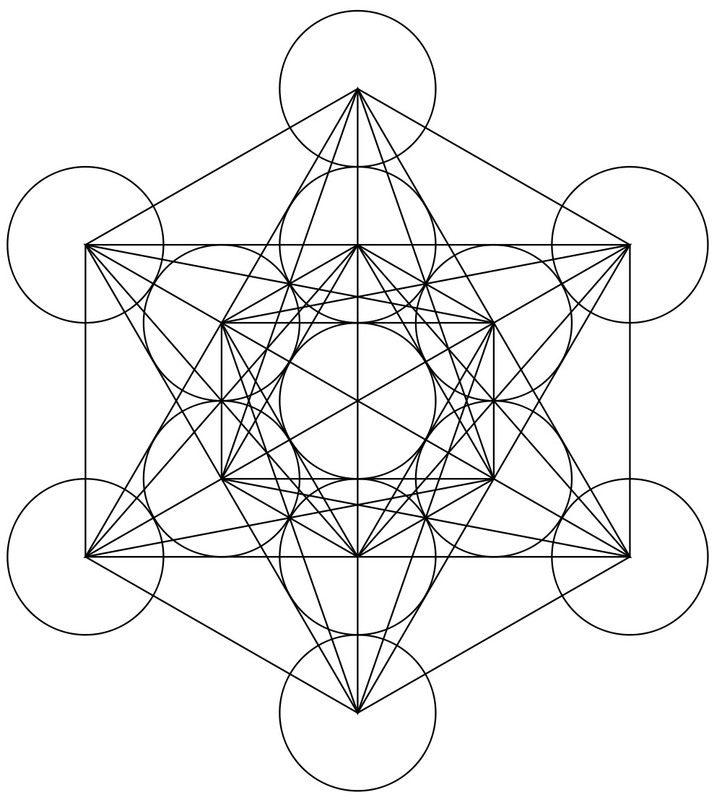 The Enneagram has conceptual crossovers with Metatron’s Cube as well as other esoteric systems. Studying Gurdjieff further, I watched the film directed by Peter Brook titled Meetings with Remarkable Men, which is an historical account of Gurdjieff’s life. I became fascinated with the dance movements and music in the film. You can view it above. I also researched some of the music used in the film and found the harmonic chant vocalist David Hykes. The singing struck something deep inside me and his sounds continually filled my studio. I attended his retreat at the esalen institute on harmonic chant and found that he was using the same MaxMSP software for sound visualization that I was using in my installations. I discussed the piece with him and he agreed to contribute both music and a sound visualization of the music. The center monitor of the installation contains this visualization, you can view it above. Each monitor in ether bardo contains an eye. Each eye represents an individual connected to all the others through a tangle of cables, chips, and computer hardware. Just as the eyes are disembodied both physically and psychically, the computer hardware itself is partly dismantled, showing the inner workings of the machines. 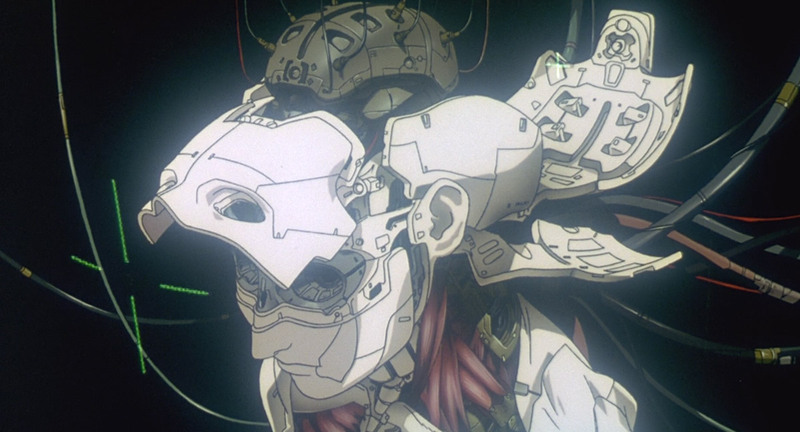 I have also been influenced heavily by Japanese animation and thought about this piece in relation to the animated feature film Ghost in the Shell (攻殻機動隊). In this future many humans have partially prosthetic body parts. The main character has a fully prosthetic body due to childhood injury and only her “ghost” or mind is still not synthetic. She begins to question the reality of her own “soul”. Later in the film she comes in contact with an entity, a kind of AI developed for international espionage, which spontaneously develops consciousness and is aware of the vast world networks of limitless data. In addition, I also see points of contact with William Gibson’s novel Neuromancer. In the book a legendary hacker’s consciousness is stored on a ROM module. The novel also blurs the boundaries between the physical and virtual world. A primary influence on this work as well of all my other recent work has been Enter the Void. The movie is loosely based on the Tibetan Book of the Dead and follows the perceived afterlife of the main character; it is unclear if this is a reality or a drug induced last fleeting moments of the brain before the end of life. The flow of the film follows the character in life, then as a kind of spirit in the bardo before finally being reborn. During moments of the movie, the floating disembodied spirit of the character is drawn to the pulsing energy of lights entering this stream of energy and color as a kind of conduit for transportation. See an example from the movie above. This relates to my work in that I am interested in transitional states and transmutations of matter and form into new forms and states of being. It also directly relates to the way the center screen visualizes sound in ether bardo, similar to cymatics. The above video is the sun time-lapse that plays in the center of the installation projected on the wall. It plays on an endless, seamless, loop. A set of custom scripts was written for all machines in the installation. Each machine would turn itself on each morning 10 minutes before the gallery would open and start playing the proper video. 10 minutes after the gallery closed at night all the machines would proceed to shut themselves down. I love to continue the idea of the machines having this afterglow of consciousness controlling them even after my physical presence is gone.